In the seventies it seems that most shows were to an extent, known for the cars that the stars drove in them as well as the stars themselves. Some of the shows you will find listed here, the cars in the shows were even known to receive their own fan mail. The weekly hero of the action packed T.V. show was almost assuredly driving a fast and expensive sports car. Most people tend to think they used the same car in every episode but usually there was a whole team of identical cars that followed the stars through the series. 1. 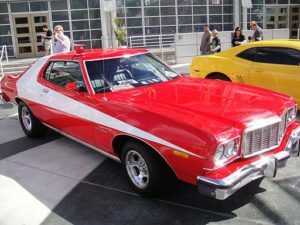 Gran Torino on Starsky and Hutch. This was everyone’s favorite Muscle Car it seemed, at least the most recognizable. The paint job (red with that big, white stripe) and the style prompted Ford to add it to their line. Gran Torino enthusiasts still get together to show off their rides to this day! 2. Do you remember Dan Tanna and his 1957 Thunderbird from Vegas? 3. Who can forget that bumbling detective Columbo and his beat up, old Peugeot? Well it can be categorized as a sports car technically, but it sure didn’t look like one or act like one. But Columbo and his Peugeot was a match made in heaven with their unkempt appearance. Some folks in Ohio ended up with the car after the show was cancelled but they revived it for the Columbo movie in the 80’s. 4. The golden Firebird Espirit of Detective Rockford is another classic. James Garner played Detective Rockford and always seemed to be having financial troubles but he could always afford to drive around in his signature Firebird. 5. 1966 Oldsmobile Toronado from Mannix. Another one of those great detective shows. Joe Mannix was played by actor Mike Connors and it was a very customized vehicle indeed and one that most people remember. Mannix had secret compartments all over the Toronado and it was a little more high tech then many cars of its era. In later episodes Mannix had an array of cars at his disposal but the 1966 Toronado seem to make the most impact. Each one of these cars is memorialized by film. If you asked anyone about the 70’s famous cars undoubtedly they would mention one or more of these cars. Of course there were a lot of others but these five seem to be the most likely to come up in a conversation about the era. After all they certainly did seem to steal the show right out from under the human stars. Jackson Porter is a staff writer at http://www.automobileenthusiast.com and is an occasional contributor to several other websites, including http://www.environmental-central.com.